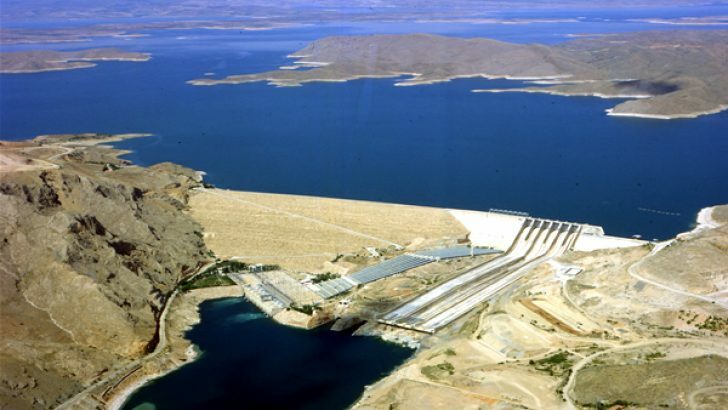 Keban Dam is a hydroelectric power plant built on the Euphrates River in the Keban district of Elazığ province for the purpose of generating electricity from 1965 to 1975. The total weight of the dam is 16,679,000 m³, the height of the river bed is 210,00 m, the lake volume at normal water level is 31,000,00 hm³ and the lake area at normal water elevation is 675,00 km². Keban Dam and Hydroelectric Power Plant‘s Lake, that is Keban Dam Lake, is the biggest artificial lake after the lake of Turkey’s Atatürk Dam. It is ranked 4th after Van Lake, Salt Lake and Atatürk Dam Lake when it is put together with natural lakes. The length of the dam along the Murat River Valley is 125 km. The width varies somewhat. Keban dam reservoir, electricity production, as well as water hunting and fish production is also performed. There are recreational and recreational areas around Elazığ and surrounding villages benefiting the people around the lake. There are many fish restaurants on the lake, especially on the pier and on the coast of Elazığ-Bingol highway, where the ferry can be used to switch to Elazığ Ağın, Tunceli’s Pertek and Çemişgezek districts. It is the first giant investments of Turkey in terms of energy. Construction started in 1965. In 1974, the first four large tribunes, in 1981, four other turbines entered the circuit. The total installed capacity of the dam is 1330 Megawatt and the annual energy production is 6 Billion kWh. When installed, the power plant meets 20% of the electricity produced in Turkey alone and currently covers 8% of the total electricity consumed. Keban Dam was thus the first huge dam created by Turkish engineers who gained experience of large dam construction in Hirfanlı Dam and Sarıyar Dam in the 1950s and is the flow of pride and pride. The dam site is located 45 km north-west of Elazığ, 65 km north-east of Malatya and 10 km further downstream from the junction of the Karasu and Murat rivers. The first suitable dam site from this junction point of the Euphrates river, which merged with Karasu and Murat rivers. The Euphrates has a very different current pattern at various times of the year. The average amount of water passing is 635 m³ / sec. The average flow rate in winter is 200 to 300 m³ / sec. . 70% of the water that the river spends in one year passes between the months of March and June during the snow melting season. Bir önceki yazımız olan Karakaya Dam and Hydroelectric Power Plant başlıklı makalemizde Karakaya Dam, Karakaya Dam and Hydroelectric Power Plant ve Karakaya Dam Hydroelectric Power Plant hakkında bilgiler verilmektedir. Keban Dam and Hydroelectric Power Plant Hydroelectric Power Plants Ordu merkezden ben Muhammet Aslan. selam arkadaşlar paylaşımın ciddiyim hayran bıraktı, sosyal medyada paylaştım 21-11-2017 13:53:08 harika ötesi. Keban Dam and Hydroelectric Power Plant için teşekkürler. Keban Dam and Hydroelectric Power Plant ve Çağatay Turgut begendim dedi. 1 Hidrojen Enerjisi Nasıl Elektrik Üretir? 2 Rüzgar Nedir ve Nasıl Oluşur? 3 Kombi Kullanırken Enerji Tasarrufu Nasıl Yapılır? 4 Aslantaş Barajı ve Hidroelektrik Enerji Santrali 5 Güneş Enerjisi Sistemlerinde Yapılan Hatalar Nelerdir?